Prof. Can A. Yücesoy of Boğaziçi University’s Institute of Biomedical Engineering has been working on a project aimed at developing a new approach to understanding the causes of muscular diseases and optimizing currently used treatments, using mathematical modeling and various experimental techniques. The project is supported by TUBITAK. Prof. Yücesoy received his undergraduate degree in Mechanical Engineering from Boğaziçi University in 2008. He was the recipient of the Outstanding Young Scientist Award of the Turkish Academy of Sciences in 2008 and the Outstanding Achievement in Research Award from the Boğaziçi University Foundation in 2009. 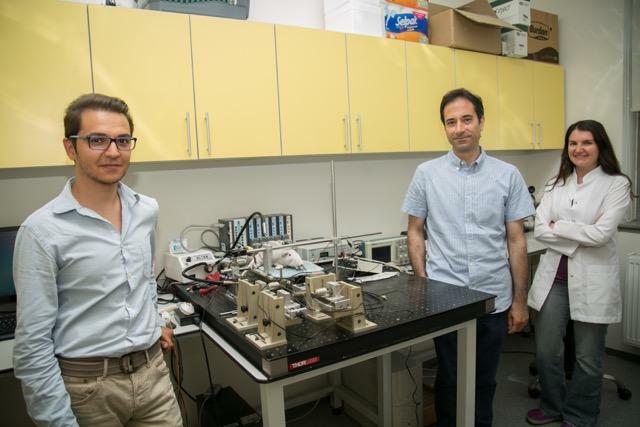 Yücesoy and his team have developed a special muscle mechanics measurement technique to be used during the orthopedic surgery of cerebral palsy patients. The team’s work in the field has been cited in international academic publications. Within the context of their work on muscle mechanics, Prof. Yücesoy has been doing research on optimal solutions to Botox injection treatments applied to cerebral palsy patients. “The word ‘sarcomere’ means small muscle in Greek; it is the fundamental functional unit of the muscle, and the length of sarcomeres is the primary determinant of muscle force. Tendons transmit this force to the joints, enabling us to move. However, we suggest that muscle fibers composed of sarcomere series and the connective tissue surrounding them are connected to each other not only in the tendons but also along muscle fibers. This makes the mechanism very complex, and causes different sarcomeres in the muscle to be different in length, contrary to widespread opinion. By means of experiments, modeling, and advanced magnetic resonance imaging techniques, we are able to show that muscles located side by side interact with each other and affect the length of the sarcomeres. This indicates that the muscle’s fundamental function of generating force and motion is neither unique to the muscle nor is it unchangeable. On the contrary, changes in conditions can change that function, too. By conditions I mean the effects of illnesses and treatments, for example. We are trying to continue our studies to further develop these scientific issues.” This new approach described by Yücesoy has widespread applications in understanding the muscle functions of healthy individuals, increasing the performance of athletes, and decreasing disabilities. Yücesoy and his team are planning a new study which will compare two patients scheduled for surgery – one of whom has never had Botox treatment whereas the second has. Yücesoy participated in the 21st International Electrophysiology and Kinesiology Congress in Chicago on July 5-8, 2016, where specialists in this field from all over the world got together. At the congress, Yücesoy had the opportunity to present the studies they have been conducting to the international world of science.